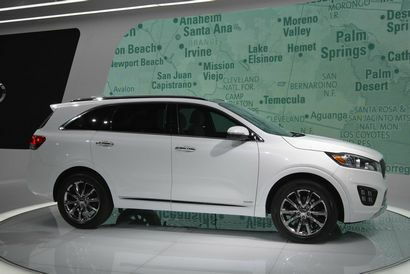 Even though it already made its debut this past August in Korea and in Europe two months later, last week's intro at the 2014 LA Auto Show was the first time most journalists in North America had the chance to eyeball the all-new 2016 Kia Sorento in person. On the outside, the design team was inspired by design elements of the Cross GT Concept that made its debut at the 2013 Chicago Auto Show. Those elements include a larger and more upright "tiger nose" grille, narrower headlights and longer hood. 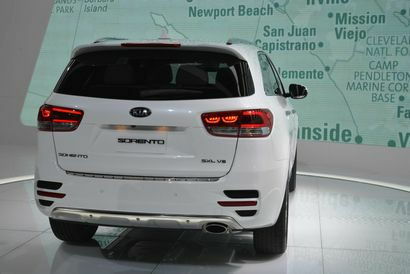 In back, the horizontal taillights are both wider and slimmer. Design elements aside, the wheelbase is significantly longer at 109.4 inches (up 3.1 inches), while overall width, at 74.4 inches, is up just a fraction (0.2 inches). Interior configurations include two-row seating on 4-cylinder models with a 40/20/40 split folding rear seat, or three-row seating on 6-cylinder models with a 50/50 split center row. Both 2- and 3-row models feature an additional half inch of leg room in the rear row(s) along with a new flat center floor. 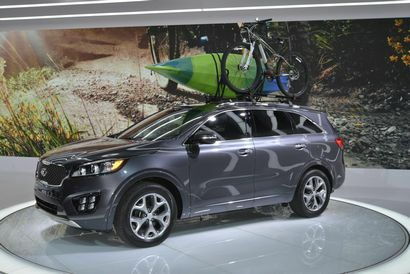 Stretching the wheelbase allowed Kia to increase cargo volume from 72.5 cu.-ft. to 74 cu.-ft., while three row models see an increase from 9.1 cu.-ft. to 11 cu.-ft. behind the third row. 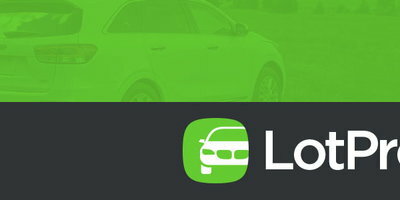 Although the Sorento's platform carries over from the previous generation, torsional rigidity has been improved by 14 percent, while the use of high-strength steel has been increased by 115 percent to 53 percent of the unit-body. Under the hood, the carryover 2.4-liter inline-4, now with Continuously Variable Valve Timing, now makes 185 horsepower – 6 less than before, while the 3.3-liter V6 is unchanged at 290 horsepower. New for 2016 is a 2.0-liter turbocharged inline-4 that splits the difference, developing 240 horsepower. All three engines are mated to the only transmission offered, an electronically controlled six-speed automatic with manumatic capability putting power to the road either through the front wheels or an optional AWD system that features Torque Vector Cornering Control (TVCC). 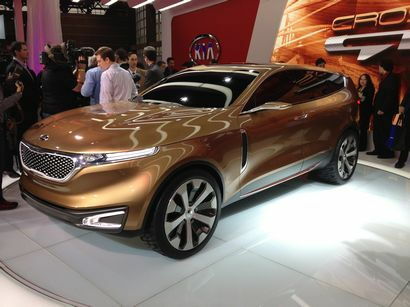 The new 2016 Kia Sorento will be available in five trim levels – L, LX, EX, SX and SXL – and sales in the U.S. will begin in the first quarter of 2015. 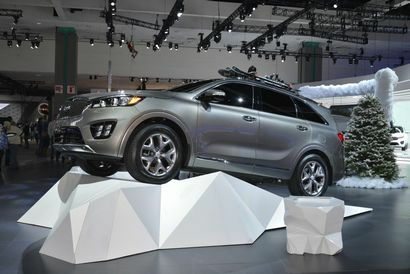 Pricing will be announced closer to Sorento's launch date.